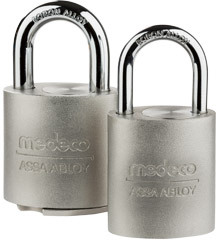 The Protector II Series padlock is made of durable, industrial grade stainless steel and offers excellent resistance to harsh weather and extreme conditions. The hardened boron alloy steel shackles stand up to physical attack, providing strong resistance against cutting, sawing and prying. The patented Medeco3 mechanical cylinder resists picking, drilling and other sophisticated forms of physical attack.